We are now just 10 days away from the start of the regular season. 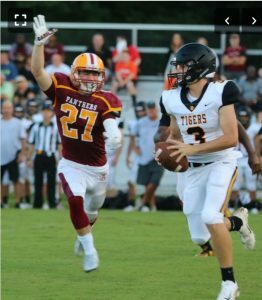 The Panthers will be traveling “Across the River” to Lincolnton, Georgia on Friday August 17th for their week zero match-up versus the Lincoln County Red Devils. The Panthers are hard at work sharpening their skills and getting ready for the regular season. Today we’ll look at some of the preseason activities the Panthers have been up to over the last week. conditions. The Panthers played in the third contest of the night, playing against the 3A Crescent Tigers. It was hard to gauge the Panthers offensively, as the majority of the Panthers starting offensive line was in street clothes on the sideline for various reasons. In all there were five or six players that participated very little or not at all during the contest. Even without some key contributors, the Panthers controlled the game from start to finish. Ja’Bryan “Dooley” Sanders was moved from wide receiver to running back this season. 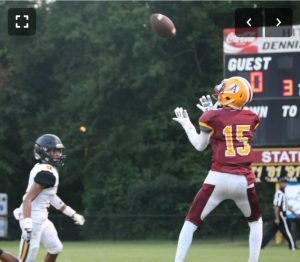 He took a hand off from quarterback JD Moore and blew past the Tiger defenders for a 44 yard touchdown run, for the first score of the evening. Moore hit Quad Woods on 34 yard pass on the next possession and set up a Robin Crawford one yard touchdown run. The extra point kick off of the foot of Dylan Beauford, sailed through the uprights to give the Panthers a 14-0 lead. A stifling Panther defense kept Crescent at bay the entire game. The Tigers crossed the 50 yard line once, briefly, before they were held to another punt. 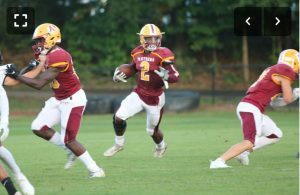 Malik Leach scampered into the endzone from 10 yards out to finish the scoring for the Panthers as they defeated Crescent by 20-0 score. Fast forward to Tuesday of this week and the Panthers hosted 5A Lexington High to Hite Stadium for a preseason scrimmage. It was a situational scrimmage where each team possessed the ball the same amount of times, from the same yard lines. They worked on goal line situations and the kicking game. The size of the Lexington team looked intimidating. The Panthers however, didn’t look intimidated. Had they kept score, it would have been in the range of 35-7, in favor of Abbeville. Courtney Jackson, coming off an ACL tear last season, looked crisp in his cuts and as fast as ever. The glaring difference from the WCTEL Kickoff C lassic was having most all of the offensive lineman participating. The Panthers dominated the line of scrimmage against the much bigger Wildcats. Defensively the Panthers gave up a pass here or there, but ultimately shut down the Lexington offense. The last segment of practice was the goal line segment. Each team had four downs to score from the ten yard line. Abbeville Head Coach Jamie Nickles could be heard shouting, “It’s overtime in Georgia boys. Let’s see what ya made of.” Lexington turned the ball over on downs at the six yard line. Linebacker Jhalyan Shuler is a difference maker on this defense. He’s big fast and seeks out contact. Luke Evans, a sophomore starter at linebacker, plays with a recklessness that is really fun to watch. Just find the ball, and you’ll find Evans near it. Starting defensive end, and Middle Tennessee commit Nate Temple was held out for precautionary reasons after getting banged up in the WCTEL Kickoff Classic. His D-Line counterparts held their own during the scrimmage. Coach Nickles said “Our lines are probably going to be our strength this year. We’ve got some good ones on both sides that will help us this year.” Carson Smith is coming back for his junior year and will be a terror for opposing offenses. Jihad Washington and Ar’Darius Burton are both big, physical defensive tackles that will be counted on as well. David Cobb, Tyreke Campbell, and Gabe Calhoun are all experienced, athletic contributors in the defensive backfield as well. The Panthers will get to play the first contest in the Greenwood Jamboree this coming Thursday night. Their opponent will be the Ninety Six Wildcats. The Jamboree will start at 6pm. JW Babb Stadium has implemented a clear bag policy this season, as well as metal detectors at the entrances. Get there early in case there are longer lines due to the new policies. Next week we’ll begin our weekly regular season game previews and reviews. Hold on just a little longer, the 2018 season is almost here. As always….